Want the best air conditioner for your RV? We review several excellent models that we feel are worth your money. There’s no secret remedy for keeping cool in extreme heat while camping in an RV, in fact the best option is to install an air conditioner on top of your RV. Not only does it cool your RV’s interior air and create a comfortable environment, but it also improves the air quality inside your RV. However, since an air conditioner uses a lot of electricity and can make a lot of noise, choosing a new air conditioner for an RV can be very stressful. Picking the right one from all the available models requires some careful consideration. RV air conditioners can’t be selected in the same way as a regular window air conditioner in your home because of the fact that most RVs have a lot less insulation so they are not very efficient to heat and cool. Plus, everyone knows that an RV is mobile and most RV air conditioners are installed on top of the RV, so that the best model should be able to withstand wind gusts, heavy rains and even hurricanes. If you’re looking for a portable AC to use in your RV, this list of the smallest portable air conditioners on the market might be helpful. This is not only one of the best RV air conditioners on the market, it’s also the quietest model that you can buy. It is best-in-class of any standard RV rooftop air conditioner for weight, air flow and capacity. Tested for use in extreme conditions. 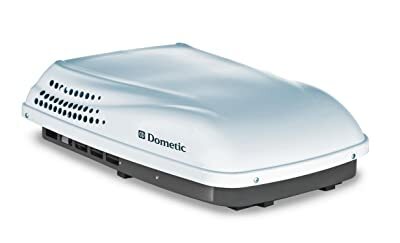 The Dometic Brisk II Air Conditioner is incredibly robust, it features a carbon steel base that had been proven the durability by coming through vibration tests lasting for 30 hours. So you can be confident that this RV air conditioner will overcome any harsh or unusual road and weather condition. While being one of the toughest air conditioners around, its 410A refrigerant is kinder to the environment. 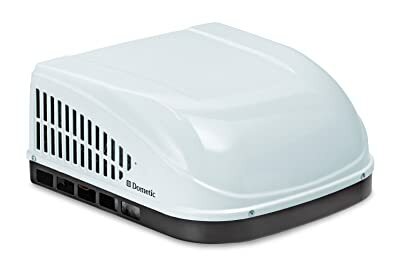 Another advantage of the Dometic Brisk II is its large air openings which promote superior airflow and cooling capacity up to 15%, while the EPP foam housing both reduces weight and also contributes to improved cooling. The most important thing that makes this unit the best choice for every RVers is that it’s quieter than most others on the market. This due to the fact that its components including the motor, compressor and evaporator are bracketed together for vibration-free, quiet operation. Long copper lines and dual rubber bushings are also responsible for minimizing noise and vibration. With Domestic’s 2-year warranty, quiet operation, lightweight and capable of performing in any environment, it won’t let you down. A unit with a larger profile creates more drag and sacrifices some fuel efficiency, which means it could end up costing you more money than a low-profile model in the long run. The Penguin II Rooftop Air Conditioner is the leading low-profile RV air conditioner in the industry and is a powerful cooler perfect for both ducted and non-ducted applications (air distribution box available separately). With a low-profile under 10 in./25.4 cm, the sleek shroud reduces wind resistance while the vehicle is moving. A rib-reinforced base pan delivers lasting strength, while its R410A refrigerant is more eco-friendly and releases heat efficiently. Domestic also offers a heat pump version of this model. The heat pump is thermostatically controlled by the Comfort Control Center II (CCC2) in both ducted and non-ducted applications. The controls automatically activate the LP gas furnace at 30 degrees for continuous relaxation. If you want to get the most out of your RV air conditioner no matter what the season, consider this Coleman Mach 15 15,000 BTU. This unit will heat as well as cool thanks to a unique reversing valve that converts the cooling powers into an efficient and powerful heating system. 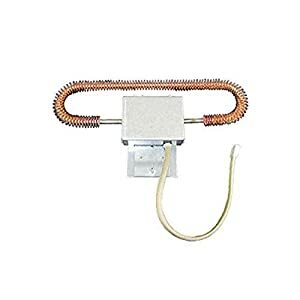 Unfortunately, this heat pump doesn’t come as a full unit when you buy from retailers, you’ll have to buy Coleman 9233A4551 Heatstrip Assembly to provide a source of warm air (5800 BTU). The Mach 15 is equipped with a 1/3 HP fan motor, the largest used in an RV air conditioner, delivering cool air at 325 CFM. It features the same streamlined shape that enhances the style and operational efficiency of all the Coleman-Mach line of RV air conditioners. Overall, this RV an all-around solid value in cooling performance. The quality built Coleman Mach 15 is one of the world’s best RV air conditioners. Most RV air conditioners require a generator of at least 3kW. 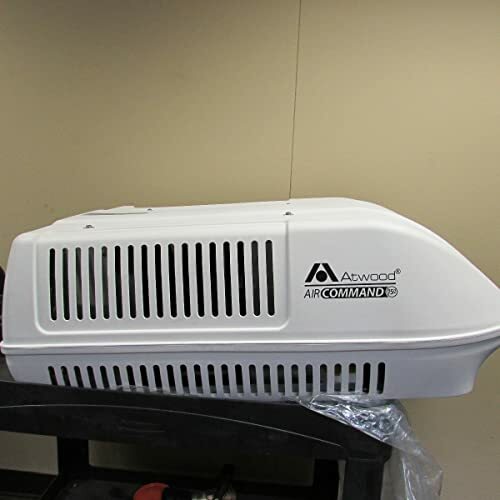 This Atwood 15026 Non-Ducted A/C Unit offers up to 15,000 BTU of cooling capacity but can be operated on as little as a single 2,000 watt generator. This due to the fact that this unit is designed to be one of the most energy-efficient RV air conditioners in its class. So if you already have a 2000W generator in your RV, then you wouldn’t want to miss this one. Read more: What is the best quiet RV generator? This high-efficiency RV air conditioner with heat pump offers comfortable camping in temperatures between 45 and 159 degrees Fahrenheit. Using a heat pump conserves up to 4 times more energy than a furnace because it pulls warm air in from outside instead of generating its own. This maintains your set temperature inside when ambient temperatures get as low as 45 degrees Fahrenheit outside, which is perfect for unexpected chilly nights and mornings. Non-ducted systems include flip down thermostats and remote controls and will fit most standard 14 x 14″ roof cutouts making Atwood Air Command an easy upgrade. Atwood’s RV air conditioners come with a 2-year warranty on all models.